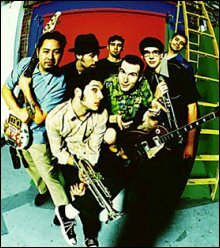 Reel Big Fish, currently the biggest ska band in the world, recently toured across Europe. We caught them in Coventry, England, more specifically just before their gig at the University of Warwick. Several senior members of staff were eager to contribute with questions as several of us have been to many of their gigs in Denmark. This current tour through Europe unfortunately did not include Denmark, but after confronting the band members we have established that it was not by their choice. Read further for more insight on their break with their record label Jive and maybe more importantly when Europe can expect to see Reel Big Fish passing through again! RF.net: Well you guys need no introduction really! Rockfreaks.net and the readers are psyched about this opportunity. We're a Danish Magazine and so several questions will be oriented towards our largest reader-base in Denmark. Firstly how is the current tour going so far? RF.net: Have you got a favourite song on this tour? Aaron: We've really been enjoying playing Unity. Its our Operation Ivy cover that we did like 10 years ago for a tribute album. And we've got Ali from Zebrahead joining in on the verses. RF.net: Also I have often been wondering what your own favourite songs are, as “Beer” probably is the unrivaled winner among the fans? Aaron: Hmmm.. I really like Kiss me deadly, but I didn't write that. Ryland: It's like choosing which is your favourite child. It's really so hard to choose. RF.net: I would have asked whether it was nice to have Scott back touring again, but as he has unfortunately fallen ill once again that won't be appropriate! How does has Scott's illness affected the both the tour in the fall and the current European tour? Obviously everyone would agree it would be better with Scott here, but do you feel the tour is significantly worse for you and the fans, as a result? Aaron: Well it just makes it a different show. Matt Wong and John do a lot of sing now. Sing the harmonies and stuff. We miss him, but this band has always just done it no matter who turned up to the show. This is how we have continued for 15 years. That's why we used to have 8 horn players, whoever is not grounded, whoever could stay up past 10 you are in the band now. RF.net: Right well there you go. So you just make due with what you have. Aaron: Yeah, we make due and if we cant do it right, well do it anyway. RF.net: Are you happy with your latest album "We're Not Happy Till You're Not Happy"? How are you guys feeling about it, especially compared with your previous albums? Aaron: I think its awesome, I think its cool the way every one of our albums is a completely different experience. It sounds completely different, it's got a totally different vibe. We sound like a completely different band every time, but not in a bad way. Ryland: I think it sounds..I think its a musical journey. Aaron: You can tell that the musicianship has improved steadily. Its really weird and very interesting experience, but they're all really good songs. RF.net: In 2004, you played at the Danish venue Loppen, a small bar facilitating roughly 200 people. Next summer, you played a slightly bigger venue, Pumpehuset, fitting 600 people. Three months later you are playing here in the UK, at The Forum in London, in front of a sold out crowd of almost 5,000 people. Will we be seeing Reel Big Fish on stadium venues here in Europe next? Aaron: We're hoping and that would be great. That is up to you the fans! RF.net: Would you agree that you have still not reach the fame status here in Europe that you have in the United States? But do you sense a growing interest here in Europe? And have have you noticed the trend of growing crowds as mentioned earlier? Aaron: Well in the UK I would say we're bigger than we ever were in America. Well I don't know it just seems we're bigger in the UK than we ever were in America. Ryland: I think fans are more enthusiastic here, which makes us think its bigger here. Its pretty even all around the world. Aaron: I think its a little bit smaller in Europe, but I think maybe it's just the language barrier thing. Its harder for people. When people really like our band, but when you don't really speak the language. Well I mean I'm not really into too many bands that don't speak English. Just because I don't know what they're saying. I wanna know what a band is saying. Ryland: I think these shows that we did on this tour in Europe were absolutely amazing. Ryland: We're going in the right direction at least! RF.net: I noticed on your website that you will be filming a live-DVD in Fullerton, California, on March 23rd. Will you maybe be planning a European counterpart and if so where would it be? Would Denmark be included? Aaron: Hmm like film a show in Denmark? Ryland: I think the band is gonna try to put out as many, either single or live CDs or DVDs. Just make as much available as possible. RF.net: The last 1½ years saw much turbulence for the Reel Big Fish members. Could you elaborate on this? RF.net: After the release of "We're Not Happy Till You're Not Happy", it seemed like you guys were not having as much fun on stage. However, several months later, we had the usual ecstatically happy Reel Big Fish on stage again. What was going on behind the scenes during this time? Aaron: Well I don't know. It's just the thing about being on tour, we play every single day. So the magic doesn't always happen the same. I think sometimes people are tired, sometimes people are sick, sometimes you just don't feel as funny, or as good! Ryland: I think the band is definitely, after 10 years has reached a point where there is a certain standard that has been slowly rising among the people in the band for the last show. There has just been a whole new standard set over the last year in particular. Aaron: We try to put on the best show we can, but every once in a while... I think when we notice nobody else notices. RF.net: No it was simply that the Danish fans were commenting on having seen you a lot more pumped that at that gig. A lot of people were wondering and there were rumours going around that there had been conflicts with the label at that point. John: What venue was that at? RF.net: That was at Pumpehuset. John: Oh okay. I remember that. No that was rad! That show was awesome! Ryland: What show was that? Ryland: Was I there yet? Ryland: Was that the show with the weird upstairs? John: No that was hmmm..
Ryland: Oh 2004 then I was not there. RF.net: Oh wait 2004 was Loppen, so it must have been early 2005. Aaron: I don't know about you guys, but I rocked. It was not my fault. John: That's where the soundboard was on.. on these wheels. It was some industrial building. RF.net: Yeah its an old factory house. John: I remember it being rad! RF.net Associate: Well maybe the fans were just in a bad mood. Aaron: I think that's it! RF.net: You guys are eating healthy, I can't see you guys getting sick. Aaron: Well it was a lot higher. It really was. RF.net: During your first ever show in Denmark, you said it was the Danish ska act Ramjet who introduced you to Denmark. How did you meet Ramjet? Aaron: Well they actually came to see us in Germany. Where was that? Remember? Hmm.. Well the first show in Germany they came down and we met them. Aaron: Sing praises to the danish promoters. Aaron: Yeah they're good guys! RF.net: Is Ramjet the only Danish band you know, or are there others you have met? RF.net: Right so they're the only reason why the danish fans get to enjoy you guys! Aaron: Yeah! It's all Ramjets fault! RF.net: During your previous two tours, you had a show in Denmark, however it seems to have been skipped this time. Any specific reasons for this? Ryland: That's our agents fault! Aaron: Agents, promoters, who knows! Somebody didn't call somebody. Aaron: We wanna go everywhere, we've wanted to go to Spain for 5 years and we finally went and played 1 show. RF.net Associate: It wasn't because you were offended by the inflammatory cartoons was it? RF.net: Can you reveal when we'll be seeing Reel Big Fish touring Europe again next time? RF.net: Alright cool that's nice and soon! RF.net: Will Denmark be included on the tour? The fans and readers in Denmark are very eager to have you guys back! RF.net: Alright the fans I'm sure will be psyched to hear that! RF.net: Reel Big Fish recently split with Jive Records can you elaborate a bit on that? From what I understand it was “thanks to major label politics” as quoted on your website. Aaron: Yeah they just kept getting bigger and bigger and buying more companies. So we just became smaller and smaller, or less important, less of a priority. And we wanted to be let go. Aaron: Even before the last album came out, we were like please just let us go. RF.net: Was it a mutual decision or was it more from your side? Aaron: Well it came from their side, since they weren't letting us go. Ryland: Yeah so eventually they said okay you can go, but the band for the last few years has been wanting to leave. Ryland: So I guess you could say technically we got dropped, but you know it doesn't matter because we wanted to leave for so long! Aaron: Yeah they finally let us that's the way we look at it! RF.net: Would you say that Jive Records had any influence on what your records sounded like? If so how much and more specifically how? Aaron: Not at all! That was the only cool thing about Jive, they never said Hey do this or do that. We gave them the records and they were like okay. RF.net: Can the fans expect a change in sound now that RBF is unsigned? If so in what way? Can you give us any peaks into the future maybe? Aaron: We are never gonna write another new song ever, because our old stuff is better! Ryland: We are just gonna redo all our old stuff. RF.net: Have you thought about your next album at all yet? Aaron: What did I just say? RF.net: Ah come on there has to be a new album, at least with all the remakes you just talked about! Aaron: We'll do the live album and we'll probably do some cover albums. Aaron: Yeah we're gonna have fun now, because we can put out CDs when ever we want! RF.net: Alright cool I'm looking forward to some of this. RF.net: So then is there a date set for the next album, this would then be the live album probably? Aaron: Yeah the live album, probably in June or July. Ryland: In the summer sometime. RF.net: Would this be only in the states or will Europe get it in June, July as well? Aaron: It will be Europe too. RF.net: When can we expect to be able to hear the first song from the new album? John: You should think of doing that for the pre-release stuff, on the website. Just like 1 song. Aaron: It's awesome! We do it too. Matt Wong is doing it right now that's why he is not talking to you! Ryland: It's a great way for people all around the world to get their music out to as many as possible. And now that we're gonna be releasing our records on our own we still encourage people to buy our records, because now we'll actually be able to see a little money from it. Where as before, when you are on a label, most bands never see a penny from it. So go ahead and download away! I still say download away, but if you really like the band, then go buy the record anyway and help support. John: Yeah you gotta realize when you are not a huge, huge main Britney Spears or Madonna, the only way we make money is by going out touring. That is why people are all so amazed when you go, Yeah we're on the road 9-10 months out of the year. It's because we won't get paid! Anything! We won't be able to make our house payments or our car payments. So support us with a record! RF.net: What do you think of the "try before you buy" policy? Aaron: Yeah that's great. I wanna hear something before I buy! Aaron: I don't wanna buy a piece of crap album! Aaron: It just encourages people to make better music, better art, better stuff! RF.net: Also I noticed Aaron has been producing other bands like recently having produced a song on the Matches new album. What does this mean for the Reel Big Fish music? And can we expect more collaboration with other bands and more producing from Aaron in the future? Ryland: I have my lounge-act Aaron is gonna be producing, its my side project. RF.net: I'm sure the fans would be very excited to hear that as well. RF.net: I noticed on your website that Ryland Steen, your new drummer after Carlos De La Garza, is offering drum lessons! RF.net So what is that for anyone? Ryland: Yeah I've just been getting emails and I try to just coordinate with people. I have only done 1 so far, but just have people come to the venue and give them a lesson and then that's that. Aaron: And then they get to come to the show right? Ryland: He just came, but just come if you wanna get a lesson. RF.net: Right cool, something for fans to know! RF.net: Are you guys psyched about tonight's gig? Ryland: We're always excited to play, every single night! Whether there is 5 people in the audience or 15 people in the audience. Aaron: We can rock them all! RF.net: Well thanks a lot for this opportunity! Any last comments for the fans? Aaron: Come to the shows! Ryland: We can't wait to see you again Denmark!